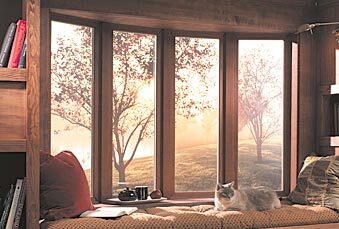 Bow windows project out beyond your exterior wall to create the illusion of a bigger interior. Typically used as a focal point in more formal rooms, bows are available with or without optional casements or single-hung flankers for ventilation. Bows come in 3, 4 or 5-light configurations, joined at 15 degree angles. or stick due to expansion and contraction.